Kenny Stills and two-time Super Bowl winner Malcolm Jenkins were among the NFL players who protested during the national anthem on Thursday, as Colin Kaepernick tweeted his support. The NFL has proposed, but not yet implemented, a controversial new anthem policy that requires all players to stand following kneeling demonstrations over social inequality in previous seasons, and Thursday's slate of pre-season fixtures saw protests resurface across some of the games. 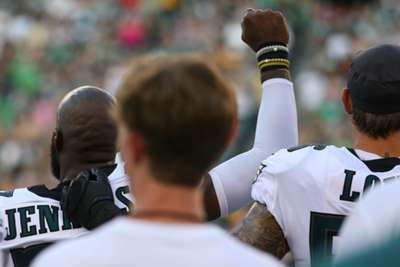 Jenkins, playing for the first time since his Philadelphia Eagles side won the Super Bowl, raised his fist - an act that San Francisco 49ers wide-out Marquise Goodwin also made prior to his team's game - while Dolphins receivers Stills and Albert Wilson both took a knee during the anthem. Kaepernick, who was involved when the protests first emerged two years ago and has been out of the league since the 2016 season, praised Stills and Wilson in a tweet that read: "My brother @kstills continued his protest of systemic oppression tonight by taking a knee. Albert Wilson @iThinkIsee12 joined him in protest. Stay strong brothers!" Speaking to reporters after the Eagles' game against the Pittsburgh Steelers, Jenkins said: "I just think it's important to keep this conversation going, that we don't let it get stagnant. "You know, as we understand it, everybody's kind of waiting to see what the league is going to do. It's just my personal decision to keep these things at the forefront." The NFL released a statement reiterating it remains in conversation with the players' union over the protests. The statement read: "The NFL has been engaged in constructive discussions with the NFL Players Association regarding the anthem and issues of equality and social justice that are of concern to many Americans. On Friday, United States president Donald Trump responded to the latest protests on Twitter by expressing his disapproval and suggesting those kneeling "find another way to protest" or "be suspended without pay". ".....Be happy, be cool! A football game, that fans are paying soooo much money to watch and enjoy, is no place to protest. Most of that money goes to the players anyway. Find another way to protest. Stand proudly for your National Anthem or be Suspended Without Pay!" 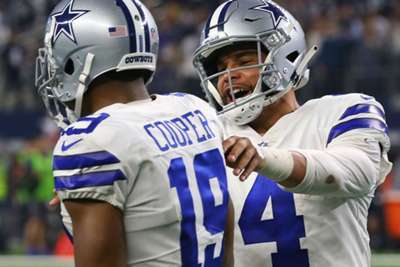 Dallas Cowboys duo Amari Cooper and Dak Prescott are getting even better together.